With life expectancies increasing around the world, neurodegenerative disorders represent an enormous disease burden on individuals, families, and society. Two forms of cellular stress are associated with practically every single age-related neurodegenerative disease: mitochondrial dysfunction, and toxicity resulting from conformationally challenged, aggregate-prone proteins. Although direct links between these factors and human disease are sometimes elusive, it is clear that such stresses ultimately lead to a decline in individual neuron function over time. To sustain correct function, terminally differentiated post-mitotic neurons must preserve their subtype identity, morphology, activity, and connectivity even in the presence of these chronic insults. The Zuryn lab uses cutting-edge molecular genetic techniques in the highly successful model organism C. elegans to understand the fundamental mechanisms neurons use to mitigate disease-related threats. The beauty of such a model is that they are able to accurately distil complex phenotypic phenomena down into single-cell and single-gene resolution. Dr Zuryn was awarded the Stafford Fox Senior Research Fellowship and opened his new lab at QBI in September 2015. One of the main focuses of the Zuryn group is the emerging role of epigenetic mechanisms that help preserve correct cell function. They have recently found that specific types of histone methylation ensure robust neuronal function in the face of stressful conditions, research that was published in the prestigious journal Science. The team’s next goal is to understand how this occurs, and to be able to predict outcomes under alternative epigenetic criteria that may influence disease progression. The Zuryn group is also interested in understanding fundamental aspects of mitochondrial biology, particularly the mitochondria's own genome (mtDNA). We have recently discovered that certain cell types in the body are prone to propagating mtDNA mutations. We are now uncovering mechanisms that counteract the mtDNA mutations themselves. To do this, they have developed novel genetic tools that allow them to probe cellular responses under stresses that model mitochondrial disease, stroke, and dementia. The aim is to discover molecules that protect cells from damage to mitochondria and that can then be used as potential therapeutic targets to counteract disease. Ahier et al 2018. Front cover. Ahier A, Dai CY, Tweedie A, Bezawork-Geleta A, Kirmes I, Zuryn S. (2018). Affinity purification of cell-specific mitochondria from whole animals resolves patterns of genetic mosaicism. Nature Cell Biology. 20(3):352-360. Hahn A & Zuryn S (2018). The cellular mitochondrial genome landscape in disease. Trends in Cell Biology. (in press). Cummins N, Tweedie A, Zuryn S, Bertran-Gonzalez J, Götz J (2018) Disease-associated tau impairs mitophagy by inhibiting Parkin translocation to mitochondria. 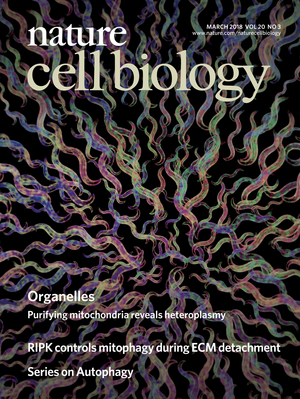 EMBO Journal (In Press). Bezawork-Geleta A, Wen H, Dong L, Bing Y, Vider J, Boukalova S, Krobova L, Vanova K, Zobalova R, Sobol M, Hozak P, Novais SM, Caisova V, Abaffy P, Naraine R, Pang Y, Zaw T, Zhang P, Sindelka R, Kubista M, Zuryn S, Molloy MP, Berridge MV, Pacak K, Rohlena J, Park S, Neuzil J (2018). Alternative assembly of respiratory complex II connects energy stress to metabolic checkpoints. Nature Communications. 9:2221. Zuryn S, Ahier A, Portoso M, White ER, Morin MC, Margueron R, Jarriault S (2014). Sequential histone-modifying activities determines the robustness of transdifferentiation. Science. 345(6198):826-829. Wilkinson R, Wang X, Kassianos AJ, Zuryn S, Roper KE, Osborne A, Sampangi S, Francis L, Raghunath V, Healy H (2014). Laser capture microdissection and multiplex-tandem PCR analysis of proximal tubular epithelial cell signaling in human kidney disease. PLoS One. 9(1):e87345. Zuryn S & Jarriault S (2013). Deep sequencing strategies for mapping and identifying mutations from genetic screens. Worm. 2(3):e25081-10. Schlipalius DI, Valmas N, Tuck AG, Jagadeesan R, Ma L, Kaur R, Goldinger A, Anderson C, Kuang J, Zuryn S, Mau YS, Cheng Q, Collins PJ, Nayak M, Schirra HJ, Hilliard MA, Ebert PR (2012). A Core metabolic enzyme mediates resistance to phosphine gas. Science. 338(9):807-810. Zuryn et al 2010. Front cover. Zuryn S, Daniele T, Jarriault S (2012). Direct cellular reprogramming in C. elegans: facts, models and promises for regenerative medicine. Wiley Interdiscip Rev Dev Biol. 1(1):138-152. Zuryn S, Le Gras S, Jamet K, Jarriault S (2010). A strategy for direct mapping and identification of mutants by whole-genome sequencing. Genetics. 186(1):427-30. Zuryn S, Kuang J, Tuck A, Ebert PR (2010). Mitochondrial dysfunction in Caenorhabditis elegans causes metabolic restructuring, but this is not linked to longevity. Mech Ageing Dev. 131(9):554-61. ​Zuryn S, Kuang J, Ebert PR (2008). Modulation of mitochondrial phosphine toxicity and resistance in Caenorhabditis elegans. Toxicological Sciences. 102(1):179-86. When cells are faced with stress associated with ageing and disease, what rapid epigenetic response mechanisms help to preserve precise cell function? This is an especially relevant question in an age where neurodegenerative diseases are reaching epidemic proportions. We aim to identify and characterise epigenetic pathways that serve to protect cells, such as neurons and muscle cells, from the types of cellular stresses associated with disease by using powerful molecular genetic approaches in C. elegans. Because mitochondria are intimately linked with both ageing and age-related diseases, we focus on stress caused by damage to the mitochondria’s own genome. Originating from an ancient endosymbiotic relationship, mitochondria possess their own genome – separate to the nucleus – and assume central cellular functions. How mitochondria and their genome behave in specific tissue and cellular contexts remains a challenging question in neurobiology. We have developed novel tools (published recently in Nature Cell Biology) to address this problem in the powerful genetic model organism, C. elegans. We aim to determine how quality control of the mitochondrial genome is regulated and how deregulation may lead to disease and ageing. QBI researchers have discovered where the highest rate of genetic mutations occurs in mitochondrial DNA. What is basic science? Dr Steven Zuryn explains the slow burn of basic science and how it is the building block for many of our current scientific endeavours and has the ability to affect generations to come.